Charity’s career has been driven by a long-time awareness and concern for environmental and health issues. She received her B.S. in Environmental Chemistry at University of California, Santa Cruz. Upon graduating from UCSC, Charity worked at Pacific Northwest National Labs, where her interest in air quality emerged while involved in an investigation of the atmospheric transport of pollutants across the Puget Sound. She built on this interest and experience during her studies at University of California, Berkeley, where she completed her M.S. in Atmospheric Analytical Chemistry while conducting field studies related to convective storm chemistry and space-based greenhouse gas measurements aboard NASA research aircrafts over the United States. 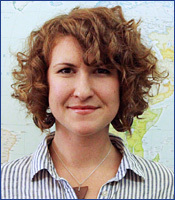 Upon completing her M.S., Charity joined the Berkeley Air team where she has applied her analytical expertise to cookstove related field studies in Vietnam, India, and Benin, studying cookstove emissions and training local field teams in fuel consumption study techniques.